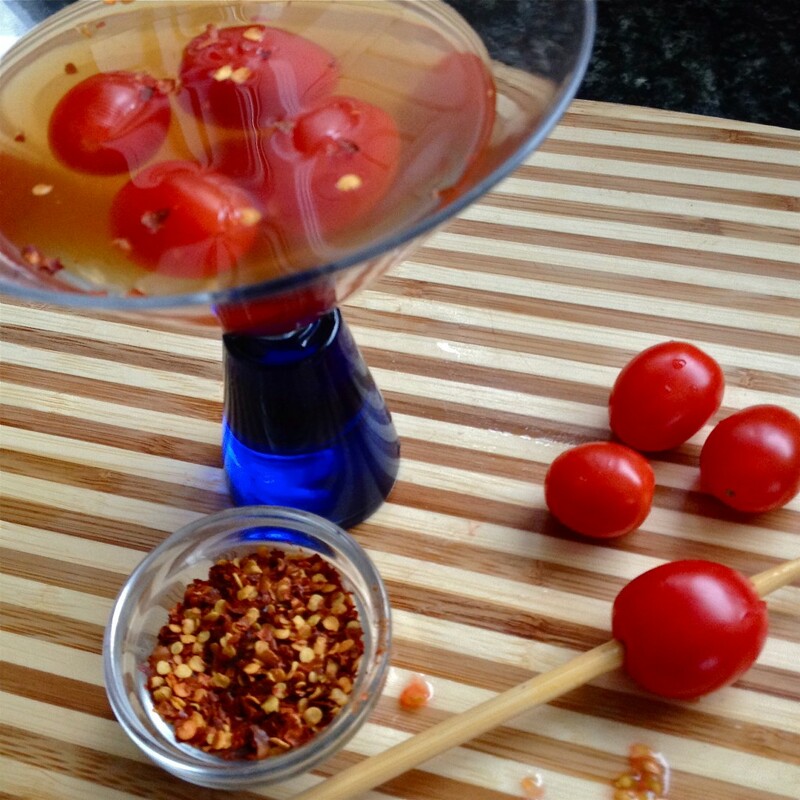 Brilliant Tipsy Tomatoes-Bloody Mary Style, for the Big Game! - Homestead Gardens, Inc. | Homestead Gardens, Inc.
Rich, that is, by way of flavor AND nutrition. So surprise, these little bites satisfy without empty loaded calories! Since we’re talking about Superbowl, why not go with winning all the way? You get your crunch, cheese, and booze, so go for it! Beans or bean dips are another healthy option which satisfies adults and kids. All of these recipes are gluten free. 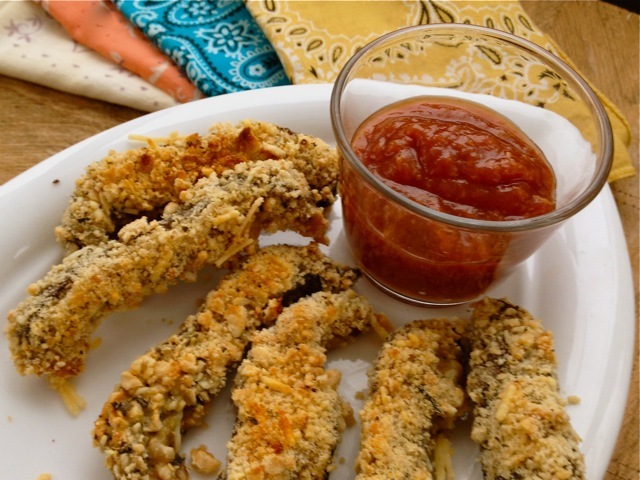 I will try almost any recipe that avoids the oily deep frying yet still gives crunch and flavor. I tested this recipe with both the huge portobella mushrooms and the smaller stuffing size. The larger size wins and certainly is more dramatic as one or two slices is just about a serving. You can make up the breading ahead to save yourself last minute fuss. Dredge the portobello slices in the flour, dip them in the egg and then into a mixture of the panko breadcrumbs, parmesan, thyme salt and pepper. Place the mushroom slices on a wire rack on a baking sheet and bake in a preheated 425F oven until golden brown, about 8-12 minutes. Arrange on a serving platter while still warm along side dipping sauce. Oh these little devils are fun! The partakers will be sure to want shots of the flavoring liquid after the tomatoes are consumed Added Bonus: Use a special vodka such as Stoli Peppar or Stoli Lemon for an added boost! You can also add a dash of Worcestershire for an extra wallop. It’s best to let the tomatoes macerate overnight in the refrigerator. Spear the tomatoes with a chopstick as shown in the above photo to allow vodka to marinate the interior. In a medium bowl place the vodka, lemon juice and hot stuff. Add the tomatoes and refrigerate overnight. Place the Old Bay Seasoning in a small serving bowl. Serve the tomatoes right in the vodka marinade as shown along with toothpicks or short skewers and the Old Bay on the side. 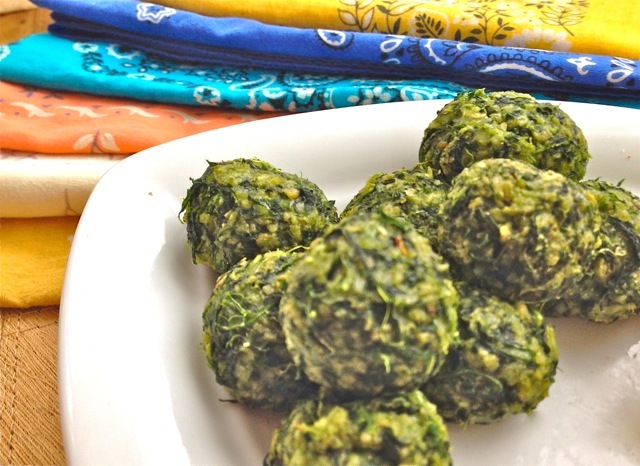 These delectable tiny spheres pack a big bite with lots of greens, a bit of cheese and a dollop of spicy sauce. Since the newest news finds that microwaving does not destroy nutrients, the greens are served well by microwaving. Originally hailing from dishbytrish.com, the recipe was vegan and gluten free. Well it’s still gluten free, but nicely spiked from a bit of flavorful cheese. Place the spinach and then arugula separately on a microwavable plate and microwave for 1-2 minutes, until wilted but still green. Place both in a colander and squeeze to remove any liquid. Chop coarsely. In the bowl of a food processor, combine arugula and spinach with all remaining ingredients (green onion through sea salt). Mix until well combined, but not mushy. Shape mixture into 1-ounce smooth balls-about the size of a 1 tablespoon measuring spoon. Place on a greased baking sheet, about 2 inches apart, and bake for 10- 12 minutes. 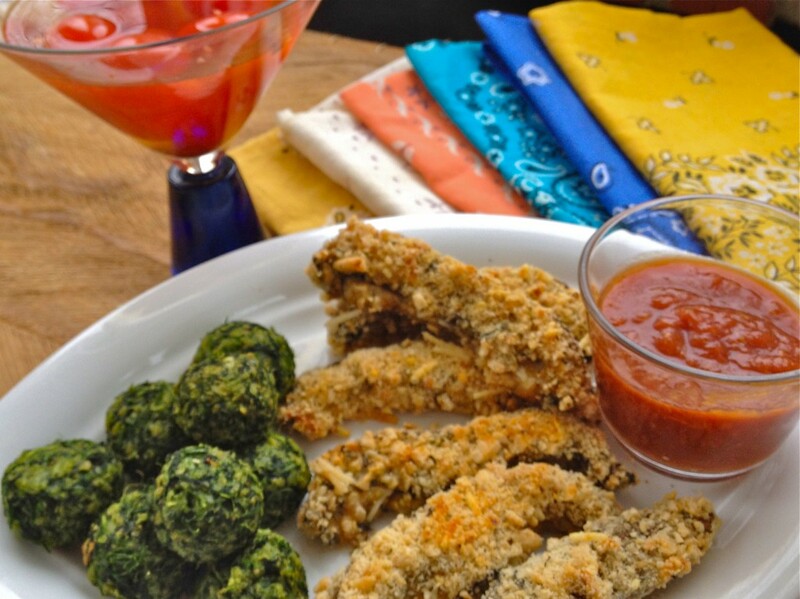 Serve on a platter with the balsamic vinegar on the side for dipping.